Garlic Cream Biscuits with Turkey Bacon Gravy! 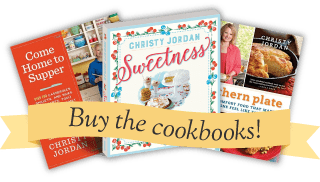 I’m thrilled to be teaming up with Formula 409 to bring you recipes and tips to make your Big Game Party the most fun yet! Today, I’m sharing my recipe for Bacon Garlic Cream Biscuits topped with Bacon gravy but I’m also sharing a great Super Bowl guide with more recipes, tips, and tricks from Chef Kevin Gillespie, my friend Erin Chase of $5 Dinners, and myself! To read the Big Game Bacon Bash Guide, click here. My Garlic Cream Biscuits are light, fluffy, and melt in your mouth. Pair them with fresh cooked bacon and a smear of bacon gravy and you have an appetizer fit for the best of games. In medium bowl, stir together flour and garlic. Add in cream and stir until it forms a stiff dough. Pour out onto floured surface and press into a ball with hands. Press out flat and then bring it into a ball again. Repeat this four times to knead. Using a rolling pin, roll out to 1/2 inch thickness. Using a biscuit cutter or juice glass dipped in flour, cut out biscuits. Place on greased baking sheet and bake at 450 for 12-15 minutes, or until lightly browned on top. Remove from oven and brush tops with melted butter, if desired. This gravy is meant to be a little thicker than usual in order to be able to smear biscuits with it. Place grease in small skillet, add flour. Stir over medium heat until flour is browned. Reduce heat to low and whisk in milk. Stir constantly until gravy thickens and no lumps remain, 7-8 minutes. 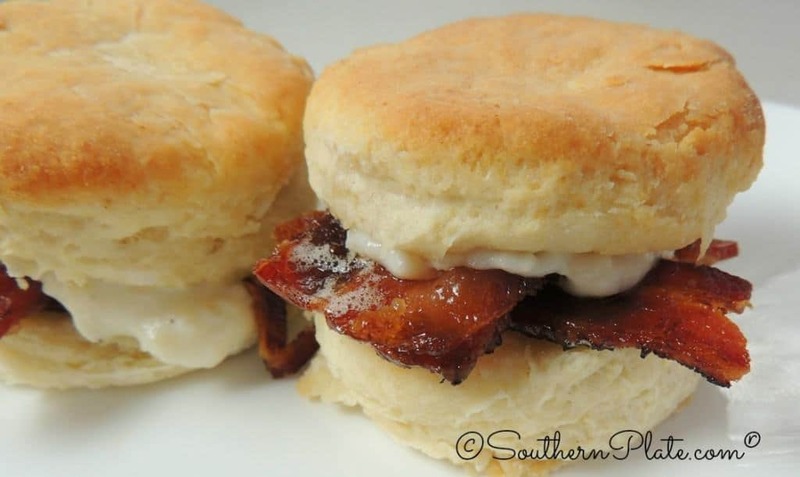 To assemble biscuits, cut each biscuit in half and top with freshly cooked bacon and a smear of thick bacon gravy. Serve warm. *This is a sponsored post by Formula 409. All opinions expressed are my own and I sure do appreciate their support of my work! I keep house and cook for someone who will be over the moon when I serve these for breakfast. Thank you in a great, big way! Oh my! Those sound wonderful!! Wish I had some RIGHT NOW! Just made the “Bacon Gravy.” Best gravy ever! Will be doing this often with the biscuits. Thanks for sharing Kristy! what is granulated garlic? could I use garlic powder? Same thing! It is just jarred garlic that has been dried! Oh my goodness, thank you so much. I appreciate your thoughts and your shares!! Please make sure to tell your Mama I said hello and give her a hug from me!! These biscuits look great….am going to make them this weekend, thaks for sharing. Christy, my dad always made bacon gravy instead of sausage gravy for us growing up!!! Love it then and still do! I’ve taken to adding bacon to the gravy in pieces just because I love bacon! Good over toast, biscuits, half-ripe tomatoes, and hashbrowns!!! Thanks for sharing!! I know this “bacon loving family” will love these! Thanks for another great recipe. OH MY . . . Thank you Christy!! Have never heard of this one, however do I need to tell you, I’m making this one for SURE!! I’ve never, ever seen ANYTHING that crispy bacon and garlic did not make DELISH!! Can’t wait for morning, now! When I was little Daddy would make this gray on the weekend for us 7 kids while Momma made biscuits. We called it “POOR MAN’S GRAVY” as it was nothing but bacon grease, flour and milk all which most of us country folks had. A lot of people will think this doesn’t sound good but it was so yummy when we were really lucky there would be the round end of the chunk of bologna left which Daddy would cut up into little cubes, fry good and brown then add it to that poor man’s gravy to go over the biscuits. TALK ABOUT SOME GOOD EATIN’!!!!! I love the brown gravy. More flavor than regular white gravy. Makes me think of my mom, because she made it. I am making these right now to enjoy with the game. They look yummy (fattening, but yummy) Thanks Christie. Oops should have been a y not an ie. Sorry. I hope you enjoyed them and the game Randy!! I agree Beatrice, brown gravy does have the flavor!! I hope you get the chance to try them soon Deb!! My honey loves biscuits and this looks like a wonderful Valentine breakfast for him. He will be impressed cause I never make biscuits before. Please keep your fingers crossed for me. I hope I can wait until then to try this out. This was just gravy at home, we only named the gravy if it was made with anything other than bacon grease. Mom made it in two styles, brown gravy which was thinner, she used water, or white, which was thick and sometimes had milk, thst was usually what she made for biscuits and gravy. It snowed here yesterday, not a lot, but it is cold, my car door quit closing, wzs not happy, took ghe car in for fixing, held the door shut by using a load binder, (what would I do without those) through the windows, but it was not warm driving with both windows open. Then to see this recipe and remember years ago, it was like getting a warm hug. I think these need to be my supper this evening!!! YUM! After reading your recipe for bacon gravy I may have the information to make what my husband has always asked me to make for him. His mother made something called egg gravy and it contained grease from fried meat, such as bacon, and finely chopped scrambled eggs. He says it was so so good. I must try this recipe and he should be a happy guy. Thank you so much for all your recipes. With much appreciation, another Southern gal. Oh please report back because I know exactly what he is talking about! I’ve always seen the recipe with finely chopped boiled eggs though, and served over thick slices of toast. I keep wanting to post it, its a dear favorite of mine, but I haven’t figured out how to make it look “pretty”!